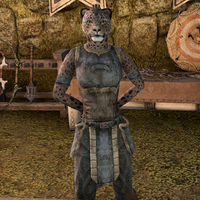 Bark-Scraper is a Khajiit woodworker who can be found by her store at the Forge of the Fighters Guild in Elden Root. Talking to her, she'll says, "Bark-Scraper does not understand this hate for fine woodcraft here in Elden Root. But then, the little walkers do many things that make no sense." This page was last modified on 25 February 2019, at 23:58.